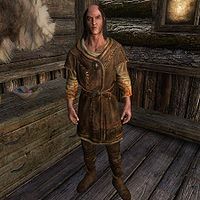 Louis Letrush is a Breton bard who is initially found in Riften, frequenting the Bee and Barb. He has an arrangement with Sibbi Black-Briar that has gone awry, with which he would like your assistance. Inside the Bee and Barb, Letrush will do absolutely nothing but stand in his corner near the northeastern entrance, leaning against a dresser, patiently waiting for someone willing to help him with his horse problem. Once you have spoken with Sibbi Black-Briar, he relocates to the forests north of Riften and waits for you to meet him there. Once the quest is completed, his actions depends on your choices (see this section for details). When you get near him he will politely ask: "Looking for work? I need someone to deliver a message to Sibbi Black-Briar." 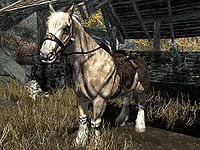 When asked about the message he will explain his problem: "Ah, well, I recently approached Sibbi Black-Briar about buying Frost, one of the finest breeding horses in Skyrim. He agreed to sell. I paid Sibbi half the cost of Frost up front, but before he could deliver, Maven had him locked up. Sibbi believes this exempts him from our deal. It does not. I want you to talk to Sibbi for me. Then, I want you to bring me Frost and the Lineage Papers that prove the horse's worth." Even if you tell him that you are not interested, the quest will start and he will say: "That's a real shame. You would've fit the bill nicely." When you return to him he will repeat: "I'm still looking for someone to deliver my message to Sibbi Black-Briar..." When you accept, he will say: "Excellent." He will then continue as if you accepted the task the first time around: "Head to the Riften jail and talk to Sibbi. Get him to tell you where Frost and his Lineage Papers are and bring them to me outside Riften. You'll be well paid for your time." You can then ask him to elaborate on a few things. When asked about why Sibbi is in jail, he will respond: "No idea, but whatever he did it must have angered Maven. No guard would lock up a Black-Briar without the old lady's permission." You can also ask why he doesn't speak to Sibbi himself: "I'm not exactly... comfortable around guards or jails. Definitely not when associates of mine have been locked up. No, I'll meet you outside of town." He will finish the conversation with: "I'll meet you outside of town." or "Go on, then. Deliver my message to Sibbi." When you approach Sibbi Black-Briar in his luxurious cell in Riften Jail and tell him Letrush sent you, he will respond: "Ah, and let me guess. He wants his horse. Well, that's going to be a bit of a problem. You see, I don't really outright "own" Frost..." When you ask him if he doesn't even own the horse, he will concur: "That is correct. You see, Frost belongs to the Black-Briar estate. Technically everything in the estate is owned by my mother, Maven. My plan was to take the horse from our lodge and deliver it to Letrush at the stables. Obviously, that didn't exactly work out as I'd planned... Still, I don't want to cross Letrush. Tell you what. Steal the horse and deliver it, and you can have the second half of the payment." Once you have accepted, a return to the Bee and Barb will reveal that Letrush has left the building. However, he is disabled until you have fulfilled the mission. At this point, you can choose to double-cross both Sibbi and Louis and go directly to Maven and tell her what is happening behind her back (note that this course of action will cause a slight bug). When confronted with the plot to steal Frost, Maven will say: "Don't tell me - Sibbi and Louis Letrush? Well, Sibbi is in jail and Letrush is certainly welcome to try. My hired help is more than a match for him." When you tell her that Louis wants you to steal the horse, she will respond: "Really? Now that is interesting... Then you should know that Louis and I have a certain... history. Tell you what. Go along with his plans for now. I'll keep an eye on you both and, when the time is right, I'll settle accounts with Louis." This will not affect Louis in any way, and you will still have to meet up with Louis Letrush in the forest after stealing Frost. You will have no choice but to follow the map marker to Black-Briar Lodge, steal Frost's Identity Papers and claim Frost the horse from the stables outside. In the forest northeast of Riften, west of Lost Prospect Mine, Louis Letrush will now be waiting for you and will be impressed when he sees Frost: "Ha! You've done it! Got to admit, I wasn't sure you could pull it off. But you've definitely earned your pay. Let's make the exchange." If you somehow managed to lose Frost he will instead say: "I see you but I don't see Frost. Come back when you have the horse with you." If you tell Maven and then deliver the horse to Louis, you may encounter a thug and Louis. The thug will kill Louis unless you intervene, and the survivor will attack you. If you deliver the horse to Louis without telling Maven, you may encounter the thug and Louis. Again, the thug will kill Louis unless you intervene, but he will then ignore you and walk away if you don't initiate combat. 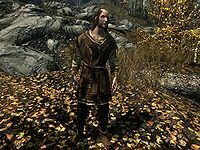 Louis Letrush is associated with a very common glitch in which he becomes duplicated multiple times and/or becomes embedded in the ground just outside Whiterun. Letrush duplicates can be dealt with by opening the console with the tilde key, clicking on the Letrush duplicate and typing kill, and then markfordelete. Louis may continue to appear in various wilderness locations even after he has already been killed. There will be no thug present; he will simply run around aimlessly. Louis doubles may or may not be killable. Sometimes killing one may cause the other to stand still and stop acting hostile.